Cut Letter Alphabet Stickers. A - Z. Sheet of 52. 25mm Tall. 2 of each letter (A - Z) supplied. Available in either Black (as pictured) or White. 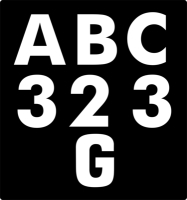 Each letter measures approximately 25mm in height. Other sizes and colours available, please 'contact us' for a quote on what you require. Stickers are cut to shape, the white that you see is backing paper. 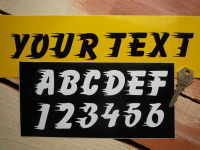 Brushscript Font. Car Number Plate Style. 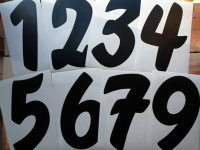 82mm Tall Letters & Numbers. Letter & Number Self Adhesive Badges. Upper & Lower Case. Workshop Coffee, Tea & Sugar Canister & Jar Label Set with Mug Labels. Jaguar Winged Logo Garage Workshop Wall Plaque. 8.5" or 17.5". 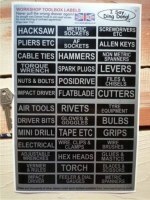 Workshop Drawer Labels Set 1. Help Identify Where Your Tools Are. Various Colours. A4. Set of 39. Cut Number Stickers. 1 - 0. Sheet of 100. 15mm Tall. Volkswagen VW Service Style Garage Workshop Wall Plaque Sign. 8" or 11".